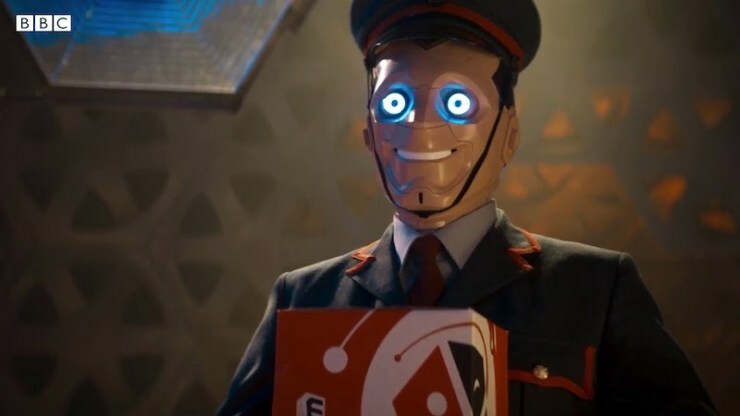 OK, so robots that seem helpful but turn sinister are not exactly an untrodden path for Doctor Who: we might think of the Heavenly Host from the not-very-good Christmas Special Voyage of the Damned, or of the information-booth dummies in the much better The Beast Below. But execution is everything: were it not so, the two very different (and superb) stories Human Nature and The Lodger would be one and the same, being based on the same core idea of the Doctor trying to lead a normal human life. And speaking of Dan: I also very much liked that this episode took a little while letting us get to know the genuinely likeable one-shot characters Dan and Kira, then straight-up killed them both. None of the usual “They were teleported away, but they’re OK really” stuff. They’re dead. I think you really have to do this. If you’re not prepared to kill people that we like, we’ll never believe that the people we like are in danger. OK, both of these characters were a little on the one-note side — Dan the absent dad doing the job for his daughter’s sake, Kira the love-starved orphan — but they were portrayed with enough charm to make it matter, dammit, when they exploded. And I very much enjoyed another way Kerblam! played with expectations: that both of the obvious bad guys, Judy Maddox and Jarva Slade, turned out to be good guys. Having watched through the first two seasons of 24 for some reason, I’ve seen as many good-guy-turns-out-to-be-a-bad-guy twists as I’m going to need for the rest of my life. Seeing the opposite happen is a pleasant change, not to mention a corroboration of the Doctor’s tendency to look for the good in people. So much for the positives. I’ve got four problems with Kerblam! that don’t ruin it but prevent it from reaching the high mark set by the best Doctor Who episodes. Second: oh, the poor companions. Yet again, they had very little reason to be there, or at least for there to be three of them. It feels as though each writer, having been handed this TARDIS crew of Doctor plus three ends up allocating the Companion jobs pretty much at random among the three of them. There’s nothing about Graham that meant he had to be the one to meet Charlie, or about Yaz that meant she had to be the one to meet Graham. They could have swapped roles and it would have made absolutely no difference to the plot. That’s really not acceptable when the characters are (on paper anyway) so different. And as for Ryan: I swear I had totally forgotten about his dyspraxia which, having been a plot point back in episode 1 has been completely dropped on the floor. The more I think about these three characters, the more I realise that what they remind me of is the random back-story generation rules for role-playing characters: see for example Chart B: Character Background on the first few pages of the Quick Character Generation supplement to the free Basic Fantasy system. It truly feels like Chibnall rolled a few D20s and landed up with some random character traits that he had no idea what to do with. Then the other writers get handed these character sheets, shrug and decide to do what all RPG players do: ignore the random back-story. Doctor: And then Kira. [The system] took her, knowing how you felt about her, to show you how it would feel! Because how you feel right now about Kira is how all those families and friends will feel if your plan goes off. Doctor: I think you do. And I kept thinking “Matt Smith would have known what to do with those lines”. He would have been sad, disappointed in Charlie. Feeling the pain that Charlie feels, but also the pain that he’s planning to cause. Speaking soft and low, drawing Charlie into his own empathy. But Whittaker just talks fast and loud, more like how David Tennant would have done it. Whittaker needs to up her game, and quickly. We’ve now seen seven of the ten episodes that make up this series. Time is running out for her to establish a distinctive character. Finally, I have this rather fundamental problem: what was Kerblam! actually about? It’s as clear as day that the titular company is Amazon In Space, and there are plenty of points that could be made about an Amazon-like company: its predatory absorption of the entire marketplace, its exploitation of low-paid workers, its failure to pay any tax (and the UK government’s failure to make it do so), and so on. This was a fruitful setup. Yet it completely ignored nearly all of this, focussing only on the worker-exploitation angle and doing that in a way that didn’t really seem analogous to anything in the real world. Were we supposed to be sympathetic to Charlie’s cause? Perhaps: wanting more people in employment seems like a good goal. 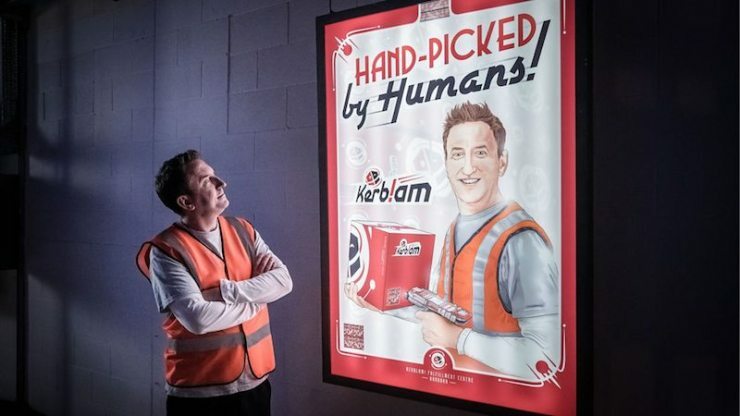 But then if they’re teleporting delivery robots right into the TARDIS, they’re evidently a post-scarcity society where no-one should need to work: where work is whetever you choose to do with your time. In the end, it’s uncomfortably close to endorsing Amazon (though I think Elizabeth Sandifer’s claims along these lines are rather too strong). So I feel like all the ingredients were here to make this a classic episode, but the recipe wasn’t up to it. Important issues didn’t get thought through. Key characters had no reason to be involved. The whole thing didn’t make quite enough sense. NEXT WEEK: more pointless complaining! This entry was posted in Doctor Who, Reviews, Series 11, TV. Bookmark the permalink. 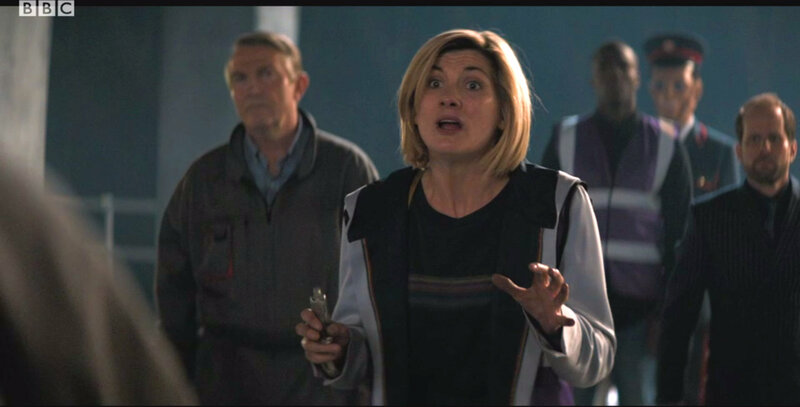 Over these past couple of episodes (I haven’t watched last Sundays episode yet) I’m encroached with the feeling that some agenda or editorial view is being forced upon Chibnall and Whittaker, limiting their creativity. They all seem to say ‘trust the loudest shouting voices’. The shouting of the not-Trump magnate (honestly, would Trump ever check something specific in person?) causing the death of the spiders (even if he did that himself, the action became ‘justified’ after being accepted by the Doctor & co. Not even a ‘doesn’t he look tired’ reprimand). In the Demons of the Punjab the actions of the ‘demons’ (no, not the aliens) that seem to support the view being shouted by our ‘leaders’ or those on the fringe in politics about minorities/’others’. I don’t know, reading my own comment makes me think I’m being paranoid, probably am. But you’re right, I think there does seem to be a theme developing — no doubt unwittingly — this is far from Doctor Who‘s usual stance.